Heat oven to 350°F. Crush cereal. Mix sugars, butter, vanilla and eggs in large bowl. Stir in flour, cereal, 3/4 cup oats, the baking soda, baking powder and salt. Stir in 3/4 cup of the peanuts and 2/3 cup of the chocolate chips. Spread in ungreased rectangular pan, 13x9x2 inches. Sprinkle with remaining 1/4 cup peanuts, remaining 1/3 cup chocolate chips and 2 tablespoons oats. Bake 25 to 30 minutes or until golden brown. Cool completely, about 1 hour. For 24 bars, cut into 6 rows by 4 rows. 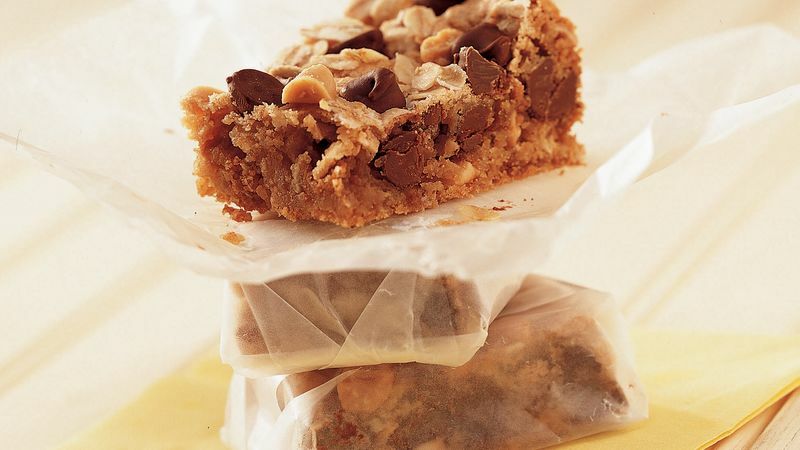 One cup chopped walnuts instead of the peanuts gives these satisfying bars a slightly different flavor. Place cereal in a plastic resealable food-storage bag or between sheets of waxed paper or plastic wrap; crush with a rolling pin. Or crush cereal in a blender or food processor.